Corporate catering comes with unique challenges that are readily handled by skilled and experienced catering professionals. Without the right level of support, these challenges can make it difficult to successfully host the event to the delight of your guests. When you partner with a catering professional, however, you can easily resolve these concerns and move on with your event plans without worry. 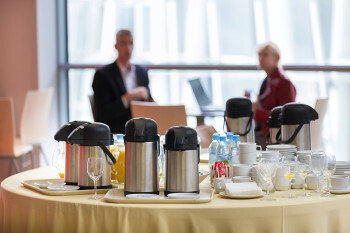 Utilize this guide to explore the top concerns for corporate catered events – and how trusted catering professionals will handle those issues. For a truly successful corporate catered event, it is vital that the venue can accommodate the needs of the catering team and your guests. At the very least, the catering team needs room to complete onsite prep and some cooking procedures, especially when serving seafood dishes. Furthermore, the venue space should have enough room for guests to gather, eat and celebrate together without crowding. If you have video presentations, the venue also needs to have A/V capabilities. To overcome this challenge, your catering team will assess the suitability of your venue and its accommodations well ahead of your corporate event date. Many corporate events have a strict budget range for the planning team to adhere to from beginning to end. Catering teams must partner with their clients to find the menu packages and level of service that aligns with their budget. With careful consideration of this factor, it is possible to host corporate catered events that look extravagant without the high price tag. Share your target budget range with your catering team to start planning your catering menu. With corporate catered events, there are many different food and service preferences to consider along the way. Your catering team must consider the preferences of your event planning team and all your guests to provide the best dining experience possible. Your catering professional will assess these preferences with an overview of the available services and menu items. With the selection of the items preferred by your guests and event planning team, you can host a memorable event for all to enjoy. Presentation is key in making sure that your corporate catered event fulfills all your greatest expectations. From the careful preparation of each menu item to the professionalism of the catering team, presentation plays a role in every aspect of a quality corporate catering experience. Catering teams must also maintain impeccable timing to boost the dining experience of all your guests. Your catering team relies on their skills and experience to maintain exceptional presentation practices every step of the way. Corporate catering teams strive to provide their clients with exceptional service and support in planning and hosting their events. By providing high quality service, catering teams can reduce their clients’ stress levels from the planning stage through the end of the event. You should always share your service expectations with your catering team to ensure all goes according to plan as you host your corporate event. With your catering team prepping and serving the food and drinks, you can focus on hosting a successful corporate event for your guests. Your catering team will help you overcome the most common challenges to ensure your event goes as planned. If you are ready to start planning your corporate catered event, partner with our team at Woodman’s of Essex. Contact us today at 800-649-1773.